IgE antibody concentration, affinity, clonality and specific activity (also known as the allergen-specific IgE to total IgE ratio) influence the translation of IgE responses into clinically evident allergic symptoms following allergen exposure. Reported IgE-specific activity levels >3–4% place allergic individuals undergoing anti-IgE (Omalizumab®) therapy at a disadvantage for poor resolution of their allergy symptoms following manufacturer’s recommended dosing schemes. We investigated the hypothesis that the specific activity of the IgE antibody response is highly variable with respect to age, allergen specificity and an individual’s total serum IgE level. Second, we investigated whether the IgE-specific activity level influences the extent and rate of loss of effector cell mediator release. IgE-specific activity distributions were plotted against age, allergen specificity and total serum IgE using 18,950 paired total IgE and allergen-specific IgE antibody data obtained from the analysis of sera from 3,614 allergic subjects and covering 182 allergen specificities. The fraction of specific IgE antibody of the total serum IgE was dependent on age of the individual, epitope specificity (clonality) and total serum IgE. The youngest group of allergic individuals with the lowest total serum IgE levels tended to have the highest allergen-specific IgE to total IgE ratios. Hymenoptera venom (54%), peanut (33%) and milk (27%) were the three allergen specificities that elicited the highest frequency of IgE-specific activities >4% among sensitized individuals. 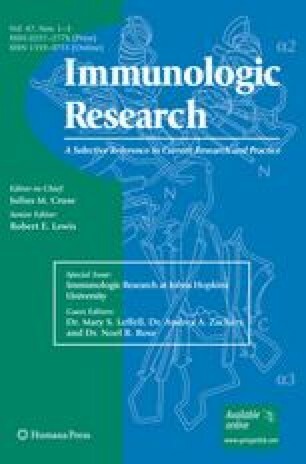 A prospective double-blind, placebo-controlled clinical study involving anti-IgE treatment of cat-allergic subjects showed IgE-specific activity was remarkably constant over the 16-week course of treatment, despite the up to 8-fold rise in total serum IgE following repetitive Omalizumab® administration. Changes in specific and total IgE levels paralleled each other in patients receiving anti-IgE therapy. The fastest rate of reduction in cat allergen-induced basophil histamine release following anti-IgE therapy was observed when the cat-specific IgE to total IgE ratio was <2.5%. This reflected the more rapid loss of surface cat-specific IgE antibody with anti-IgE therapy in allergic individuals who displayed a more diverse IgE antibody repertoire. We conclude that IgE-specific activity is an age-, IgE heterogeneity- and total serum IgE-dependent variable that influences the magnitude of effector cell mediator release, and by inference, ultimate allergic symptom induction. The authors acknowledge the excellent basophil studies performed by Patricia Sterba and Jack Wisenauer for his excellent work in the analysis of the cat-specific IgE and total IgE levels in the clinical study subjects. This work has been funded in part by Asthma and Allergic Disease Research Centers Grant U19AI070345 from the National Institutes of Health.